You’ve built a decent subscriber list. You’re generating quality content. But if your emails are largely unopened and your calls-to-action are going unclicked, your messaging is that tree falling in the forest with no one to hear it. What do you do about this? There’s nothing more frustrating than investing the time and effort required to create compelling communiques to your customer and prospect base. It’s not like your spamming them…they opted in when they signed up, right? But inboxes are usually crowded, hundreds of other messages compete for your readers’ attention, and frankly, as clever as those subject lines you’ve crafted may be, you’re doing something wrong if your emails go unread. Don’t be impersonal. If your email sounds as if it’s coming from a corporate entity, the gun is already pointed at your foot and the hammer is cocked. Write in your own, friendly individualized voice. Don’t hesitate to entertain. Send the missive under your name and from a dedicated email address in your name, too. Write the message in a first-person voice. It shouldn’t read like a mass-mailing, but a personal one-on-one missive. Ideally, the salutation (“Dear Steve…”) should be customized with the recipient’s name and then used sparingly throughout the text. “You-tilize.” The word “you” is one of the most powerful, personalized words in the English language. Use it instead of generalized, third-party references such as “customers,” “people,” “business executives,” etc. Don’t waste people’s time. While we’re strong believers in regular, frequent messaging, don’t send an email if you’ve got nothing to say. There’s no value in simply filling up space and, odds are –if you put your mind to it—you’ll come up with something worthy of sharing. Be genuinely helpful. While you may occasionally use email to conduct a survey to do a little data mining, by and large, your messaging should be about providing valuable information, not capturing it. Empathize and assist. Over time –and preferably in short order—you should establish bonds of trust with your readers by expressing an understanding of the problems they have and providing helpful tips and solutions in your content. Create the feeling that you are in their corner. Pique curiosity. A good tease will open that email, but your pay-off better be legit. Nobody wants to feel cheated. Use compelling language. Words that convey emotion or peril have impact. It never hurts to suggest the consequences of not making a good decision. Lists. Valuable information provided in quick, easy, digestible bullet points are read more frequently than dense bodies of copy. Use numerals (“11”) instead of words (“Eleven”) in subject lines. Reward the reader. Maybe your email is only a 90-second or two-minute read. But that’s an investment of time that could have been spent on any of a hundred other messages in their inbox. Make sure they take away something of legitimate value. Don’t be boring. Do not commit the cardinal sin of the Information Age. Choose interesting topics and convey them personally, not clinically. Fast and short. Odds are, the less tortured the writing of the content, the better it will be. In other words, the more your words trip lightly from your head and heart to your fingertips, the more personalized it will come across, and the more effective it will be. And don’t make your content unnecessarily long when concise copy will do. There’s a reason that “Reader’s Digest” was successful for nearly a century. Emails may be as short as 300 words and as long as 1200—the nature and demands of the content should dictate length. Create a dialogue with your reader. Ask your customers questions that they will ask themselves. This helps foster the problem-identification process that will lead them to ultimately engage the products, services and solutions you provide. But remember: It’s imperative that your emails don’t read like marketing messages, but genuine reach-outs of friendly assistance. Don’t sell your solutions. Sell the benefits they provide. And don’t try and close a prospect before they’re ready. Provide the resources and information they need to make their own decision as to when a purchase or deal is in order. Illustrate risk. Most people are more risk averse than they are proactive in making sound decisions. Illustrate the perils they face if they don’t engage the type of solutions you provide. Post deadlines. Encourage click-throughs to your offerings –whether they are additional free resources or promotional sales offers—by posting a deadline on the call-to-action. Again, the risk of missing out on something is often more compelling than the actual benefits to be reaped. Clarity and connectivity. Make your calls-to-action (CTA) easy and unambiguous. The prospect should know exactly what to expect, and whatever process the click-through launches should be as effortless as possible. 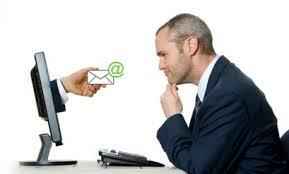 Provide numerous links to your CTA throughout the email for multiple click-through opportunities. Create emails that provide compelling, valuable information; publish consistently, and readers will not only read your messaging, they’ll look forward to it and act upon it as well.